The Beauty Scoop! : My Xen Tan Spray Tan! Back in July, I attended a Xen-Tan event and I've been wanting to blog about it ever since, but due to internet/email/laptop issues, have been unable to do so, until now. The event was focused around the Xen-Tan brand, the products within it and celebrity fans of the brand, which you can also view here. At the event, I met lots of lovely people, got pampered with a Jessica manicure and a Xen-Tan spray tan, and came out of it actually looking alive, rather than the almost deathly pale shade that I usually sport. I chose the darker shade of tan and was really, really pleased with it. It wasn't too dark, and it wasn't orange in the slightest. I could see the colour difference straight away when I moved the string of the oh so flattering (and not at all embarrassing to wear) paper knickers to another position and I already felt better for having a 'healthy' colour. Chatting with lovely bloggers and PR ladies. And again. I love how my tan looks here, especially on my legs haha. Over the course of the evening, my tan developed into a lovely, even shade - bar my hands which were noticeably paler than the rest of my body. I think the girl who did my spray tan was a bit too cautious with them, and so this was the result of possibly over-moisturising them and just doing the one coat of tan as opposed to the 2 she used on the rest of my body. My tan shortly after having it done, note the pale hands, especially my right hand. Nail polish used in my manicure, which is just about showing was 'Venus Was Her Name' by Jessica. That being said, I was still pleased with the tan in every other way, it lasted about 11 ish days before I felt it had faded noticeably, but evenly, and would happily go back for another... just without the pale hands lol. 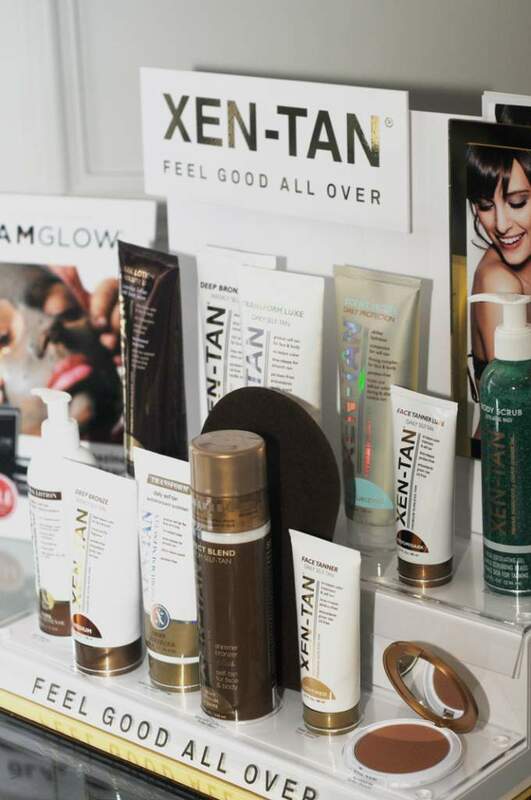 Apologies that the only images I have are ones taken at the event by Xen-Tan and the PR team - my images of my tan etc were on my old laptop that I no longer have access to. Also, apologies for the way I look in the image above, no make-up (bar tinted lip balm), flushed cheeks and my hair just scraped back off my face coupled with extreme awkwardness in front of the camera is not a good look for me haha. I still haven't blogged about this yet either. Will be wearing my tan at the weekend so will put something together. I love Xen Tan as a home tan but I've never had it used in a professional capacity. The colour always seems to last for ages on my body and doesn't dry my skin out too much.